You’ve seen them on your favorite professional tennis players, golfers and even on the shelves of Costco. With the heat rising and the risk of heat illness looming, risk managers are looking for ways to keep their fellow employees cool. Hence the introduction of the cooling towel. While it is not a new concept (I was personally using these 15 years ago in Omaha, Nebraska), these new towels are being gobbled up by consumers. So, the question is – do they really work and are they safe? Before we discuss body cooling, let’s go back to 4th grade science class for a minute. When it comes to temperatures, two competing temperatures when mixed together will equalize themselves, becoming a single temperature. This works well when using two exact volumes of water (8oz for example) but when one volume out numbers the other, the temp will generally remain on that side of the scale. This is why heat illness and hypothermia occurs – your body cannot compete with the volume of air/water temperature around it. This also explains why wetsuits work so well. And why under less extreme circumstances, these towels provide relief. 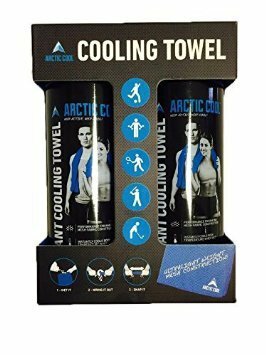 The process that these new towels utilize is evaporative body cooling (EBC2). EBC2 is not a new concept. Your body uses EBC2 to cool itself and humans have since the dawn of time. Actually, the body uses two processes to remove excess heat (stabilize the body’s temperature). The first is convective body cooling. This is simply where the body moves heat to the surface of the skin and because the ambient temperature is much lower than the body’s the heat equalizes with the air temp and creates a cooling sensation to the body. This process can be experienced by sitting on cold concrete. Your bottom will not sweat, but it will get cold. EBC2 on the other hand is the natural process of body sweat. When the air temp is too hot, the body cannot feel cool because the convective process equalizes at a temp too high for the body – above 98.6. So the body pushes sweat to the surface of the skin and the sweat/water uses the body’s heat to turn (basically boil) the sweat into steam/vapor and move it off the skin. This accelerates the cooling effect on the body because it is using more of the body’s heat thereby cooling it down. EBC2 works well when the vapor has somewhere to go. When humidity rises (typically not a problem in Southern California) the air is already holding a lot of water making it hard to hold more. This again is another science experiment – saturation. Your body will not be able to release the moisture making it more difficult to cool down. People have been pouring water over their heads for decades, wrapping towels (Consumer Reports article) around their necks for centuries and in extreme survival cases even urinating on any piece of cloth (watch Dual Survivor) to create this EBC2 process. Hey it’s better than dying in the desert. The point is that the you don’t need a special towel to create the EBC2 process; however, these new towels do somethings much better than other fabrics. And that my friend is why they are such a hot product. Technology is constantly advancing and it doesn’t stop with computers. Fabrics have progressed tremendously – wrinkle free, odor protection (adding silver), moisture wicking, uv protection and much more. The same holds true for these new cooling towels. 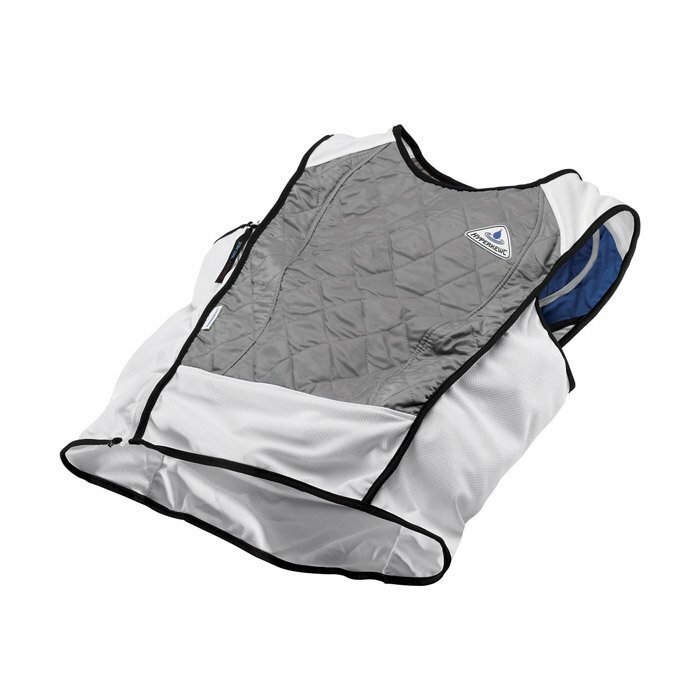 The fabric is lighter, holds water better, releases water in a more controlled fashion and much more. Sure you can use your kitchen towel, but only if you like to get wet and don’t mind lugging around a few extra pounds. Or if you like, you can even make your own. Enough talk, let’s take a look at the numbers. 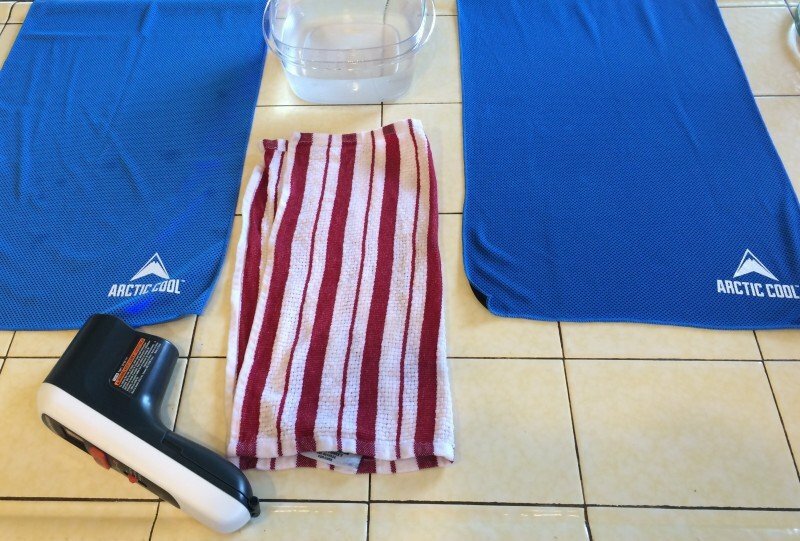 I took two identical cooling towels, left one dry (left) and followed the directions on the other one (right). I also threw in a kitchen towel just to see the difference. So, do the special towels do something special? That’s a 3.3 degree drop in temperature. Something in the towel is interacting with the water to cool it down further. And those 3.3 degrees can make the difference between life and death. Just remember that using colder water (ice water) can drop the temperature even further. The body contains several Pulse Points – areas where large volumes of blood circulate through your body. Cooling the body’s life syrup also helps cool the organs it supplies and the rest of your body. The neck contains a large pulse point and is easily accessible. As a risk manager, there are two primary concerns that I have with the towels. Number 1 – the towels are loose and can easily be caught in moving equipment. Unlike golfers and tennis players, our employees are working around heavy and dangerous equipment. Loose dangling clothing, jewelry and towels can easily create an additional safety hazard. Number 2 – using the towel as a crutch. 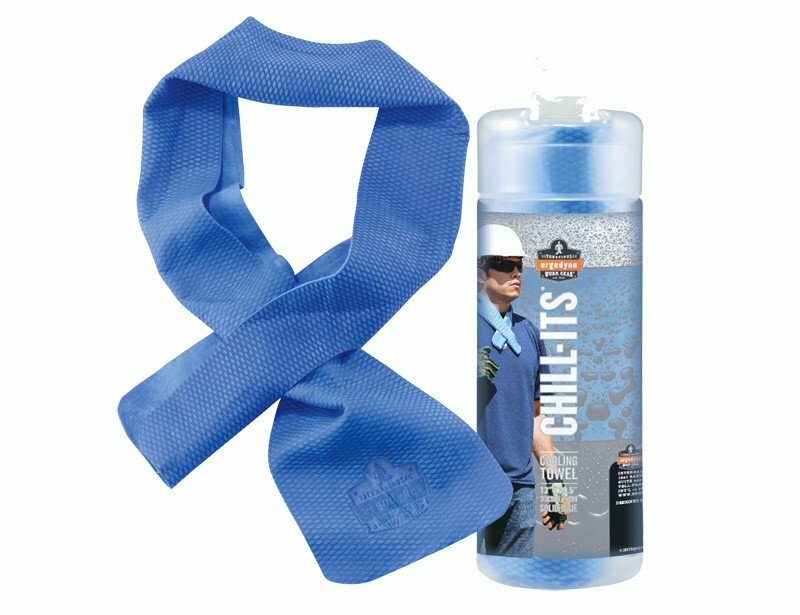 Just because you have the cooling towel doesn’t mean that you can forgo proper hydration. The towel is an ancillary device and should be utilized in conjunction with proper hydration and food consumption.